Meet Hayley and Matt — two genuine people, one sweet couple. I’ve absolutely loved getting to know Hayley throughout their wedding process as well as Matt - I hear he’s a great cook (he’s making their wedding cake!) I’ve been fortunate to have photographed many photographers in 2018 and 2019 and I’m excited to say that Hayley is among that group! You can check her website out here. We met at Pokagon State Park on a gorgeous October evening. 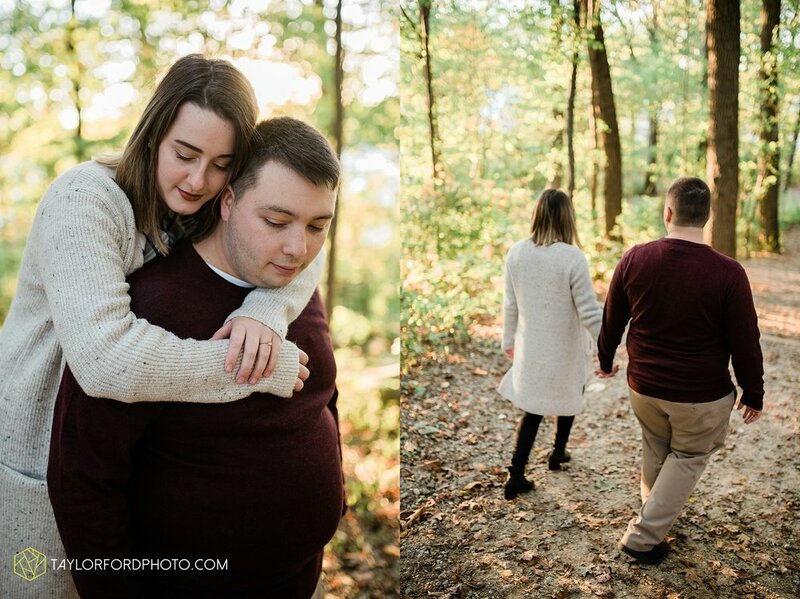 These two love traveling and nature so Pokagon was a must for their portraits! We hiked around the park and talked about everything — from the perfect air conditioning temperature in their apartment to all of the wedding venues they visited before they landed on The one. I’m so excited for their downtown Fort Wayne wedding this summer! Their wedding venue is one of my favorites — such a gem! KFC....lol we both worked there. What is the story of your proposal? We love to hike so we decided to vacation to the Smoky Mountains. We set off on one of our biggest and longest hikes ever, the appalachian trail. When we got to the main viewpoint, Charlies Bunion, Matt pulled me aside and told me to set up the tripod to take photos. We took one photo, nothing. We did another, and he proposed! Her: Eating Red Robins and playing Mario Kart together. Him: Eating out at a steakhouse and playing mario kart ;). Really any game/movie night we can snuggle up to. Her: How supportive and loving he is...as well as his hazel eyes. Him: Her sense of humor and passion for what she does. She's all heart! Her: Having someone I can start a family with as well as all of our future adventures. Him: Finding and creating our home together then filling it with a family + dogs!